The problems, asso ciated with gaps in the behavioral development, are affecting not only the purebred puppies. In the recent years, many people are adopting pets from shelters and they also may face the risk of the same kind of problems - signs of gaps in the early development of the dog. If the dog gets into a shelter from the street, there is a big possibility, that it grew out of a puppy born from a homeless dog mothers. Also, it is likely that until the age of 3 months - in this age puppies begin to walk around their "home" and here they are caught by the dog-catchers - it did not communicate with people properly. 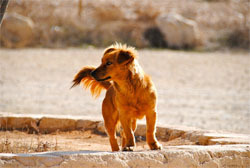 This means, unfortunately, that in a family that is adopting a stray dog, it will not be able to fulfill all expectations - to be communicative partner, actively collaborating with the owners. So, if people decided to rescue this dog and give it a shelter in their apartment, they should not really expect from it the same love and devotion, that can only be given by a correctly and timely socialized dog. In most of such cases, the savior only has to remain stoically his duty and give the rescued dog enough chances to live as it was taught by the environment.